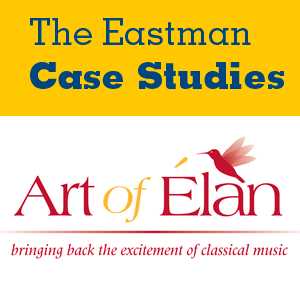 In 2007, violinist Kate Hatmaker and flutist Demarre McGill founded Art of Élan, a presenter of chamber music concerts for the San Diego metropolitan area. The group offers art music performances of a wide variety in venues outside of the traditional concert hall. Since the inception of Art of Élan, Hatmaker has sought the right balance of personnel across the organization. In 2017, she was introduced to the idea of succession planning through a coaching program for local leaders guided by current or former CEOs of not-for-profits. Her eyes were opened to understanding the roles people played in her organization, as well as to considering long-term plans for Art of Élan. The case reveals the draft of a strategic plan, which includes attention to future staffing and financial goals for the organization. With the loss of Art of Élan’s director of community engagement, Hatmaker took up this role, in addition to her position as executive director and artistic director. At the same time, she is interested to see if or how Art of Élan could survive without her full attention to these areas.